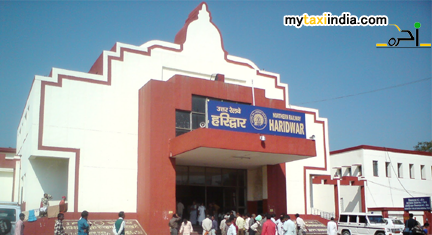 The Haridwar Junction is also referred to as the Haridwar Railway Station. This is the only railway station in the holy city of Haridwar, Uttarakhand state, India. It comes under the Moradabad division of the Northern Railway zone, Indian Railways. Earlier until 1886, the city was first connected with railways through Laksar, through branch line. Thereafter, the Oudh and Rohilkhand Railway line was extended through Roorkee towards Saharanpur and then extended to Dehradun in the year 1906. The railway station is precisely situated on the south side of the town. It is equipped with many modern amenities for tourists. A computerized reservation facility is available for travellers. Electrification for the station is under progress. Hiring a taxi in Haridwar will help you enjoy the tour in Uttarakhand state and areas around better. Haridwar is a city and municipality in the Haridwar district, Uttarakhand station, India. The place is known for some amazing tourist spots. Har ki Pauri or Brahmakund is one of the major attractions here. Legends have it that this is the place where divine nectar fell from the pitcher. Kumbh Mela celebrated once in 12 years is held at this place. Chandi Devi temple is situated on the top of the Neel Parvat. It was built in the year 1929 by Suchat Singh, the King of Kashmir. A cable car has also been introduced up to Chandi Devi Temple. Maya Devi Temple is also a must visit here. Legends have it that the heart and navel of Goddess Sati fell here right when Lord Shiva was taking her corpse. Other important places to visit here include Mansa Devi Temple, Sapta Rishi Ashram, Sapt Sarovar, Daksha Mahadeva Temple, Bhimgoda Tank, Bharat Mata Mandir, Ma Anandamayee Ashram, Neel Dhara Pakshi Vihar, Doodhadhari Barfani Temple, Sureshvari Devi Temple, Pawan Dham, Parad Shivling, Ramanand Ashram, Sati Kund, and many more. If a tour at Haridwar is in your mind, let My Taxi India take care of your tour related needs. We guarantee a fun filled tour in and outer regions of Uttarakhand. The services offered here are oriented towards a highly efficient and comfortable tour experience. Allow us a chance to help you with the best facilities for tour to holy city of Haridwar. Our prices are the best in the industry. Here, we will provide you with updated info and latest technology and the best car hire service. Book a taxi with MY Taxi India and experience the difference.